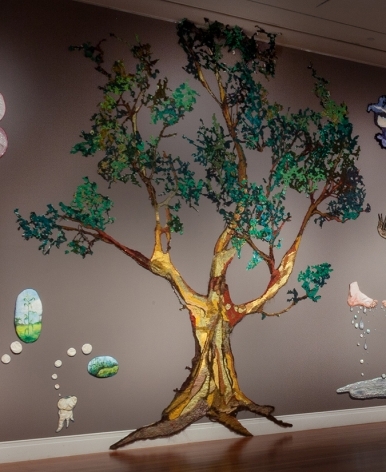 I Was Trying Hard to Think About Sweet Things is a mid-career retrospective of New Orleans artist Gina Phillips; born in 1971 in Madison, Kentucky. 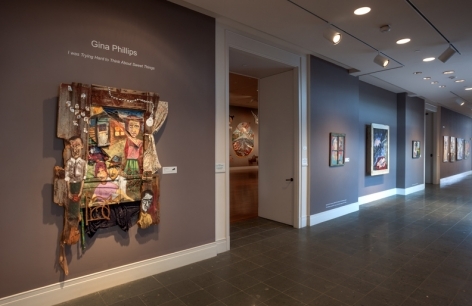 Gina Phillips is a painter, sculptor, fabric artist, educator, and musician, She received a Bachelor of Fine Arts degree from the University of Kentucky in 1994, and a Master of Fine Arts degree from Tulane University in 1997. 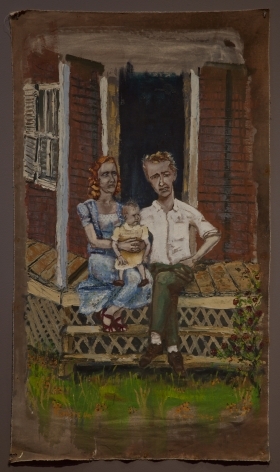 Her work is included in private and public collections worldwide, including the University of Kentucky, Lexington; New Orleans Museum of Art; Frederick R. Weisman Art Foundation, Los Angeles; The House of Blues Collection; NASA; the Ogden Museum of Southern Art, New Orleans; 21C Museum, Louisville; The Collection of Thomas and Dathel Coleman, New Orleans; The Drake Hotel, Toronto; and Tulane University, New Orleans. Gina Phillips was born in 1971 in Madison County, Kentucky. Her childhood was spent living with her extended family in a rural landscape marked by an absence of modern conveniences. The family used a coal-burning stove and heated water to take baths in buckets. Her grandfather was a mechanic, and their property was basically a private junkyard filled with objects that could be repurposed in a practical or artistic way. 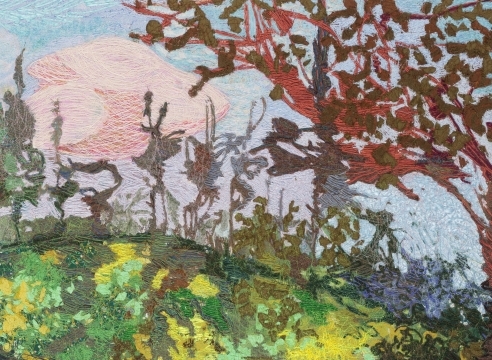 If, as the English proverb claims, necessity is the mother of invention, then perhaps Phillips’ upbringing can be credited for her unique use of materials and her boundless imagination. At 18, Phillips moved to Lexington, Virginia to attend the University of Kentucky. She decided to major in Architecture, feeling that she should not allow herself to follow her passion in art, but to go into a field that is traditionally more lucrative. She wasn’t initially accepted into the architecture program, so she took some art classes to fill the time. Immediately, she realized that she had been denying her true passion. She graduated in 1994 with a Bachelor of Art in Painting. 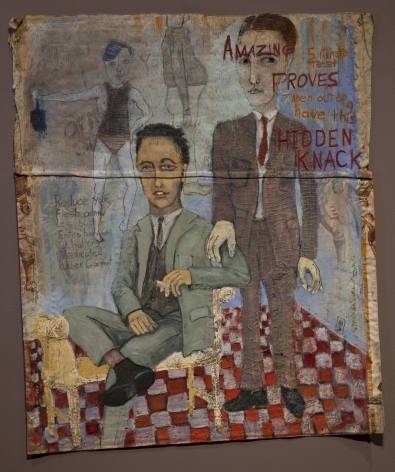 It was at the University of Kentucky that she defined the trajectory of her work in both medium and subject. 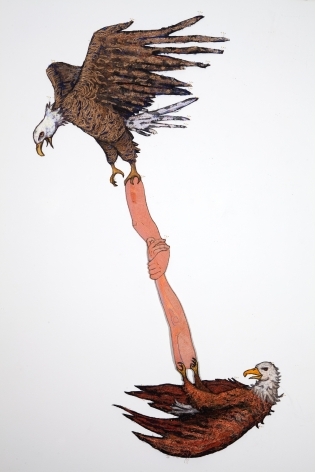 Drawing from the characters of her Kentucky home, including her family, she developed a tragicomic narrative style. Much of this early work combined painting with mixed media construction repurposed from her grandfather’s junk yard and her grandmother’s fabric collection. In 1995, Phillips moved to New Orleans to attend Tulane University, where she received her Master of Fine Arts degree in 1997. At Tulane, she continued in her signature narrative style, but the medium become more delicate, more focused on fabric. Initially, she combined printed fabrics with painting, allowing the prints to interact with her figurative scenes. Eventually, she moved to pure fabric works for the first time. In New Orleans, Phillips found home. The city reminded her of Kentucky with its funky landscape, open and quirky characters, and the “shackiness” of the vernacular architecture. She also became fascinated with the city’s exotic difference, the richness of its history, and the inclusive, interactive nature of its traditions. She bought her first house in the Holy Cross neighborhood in the Lower 9th Ward of New Orleans in 2004. Spending the next year renovating the house into both home and studio, she called it finished in mid-August of 2005. One week later, Hurricane Katrina hit the Gulf Coast. The Federal Levee System failed in New Orleans, and her home was flooded with four feet of water. In December of 2005, Phillips received a grant from the Craft Emergency Relief Fund, allowing her to purchase an industrial long-arm quilting machine. It was a dream come true. No longer confined by the scale and limitations of a common sewing machine, she was free to work at any scale, and move the thread freely. With this “dream machine,” Phillips began to use thread in a way that painters use paint. “To me, making art is one half a desire to tell a story, and one half a love of the materials,” she says. 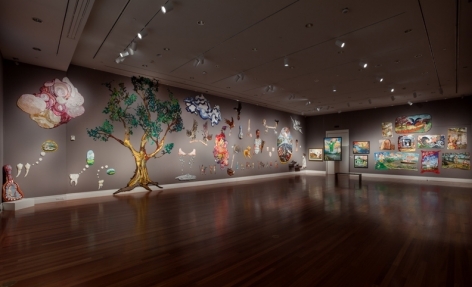 This exhibition is the culmination of a long relationship between the artist and the museum. Since the founding of the institution, Phillips has worked with the education department to teach art classes, both in the museum and in the public schools of the region. She is not only an important rising artist whose work is held in the permanent collection, but she is a dedicated supporter of our mission. I Was Trying Hard to Think About Sweet Things is a survey of the work of artist, Gina Phillips, including works ranging from the raw narrative works made of paint, wood, metal and fabric in her early years as an artist in Kentucky, to the sophisticated narrative fabric work created on her “free-motion thread-drawing machine” in the Lower 9th Ward of New Orleans. 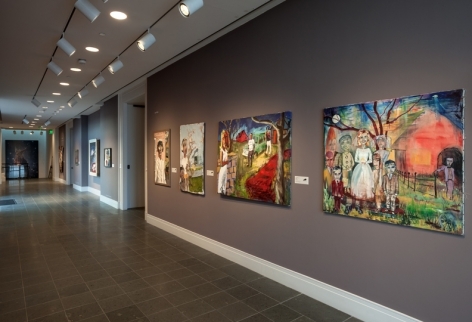 It opened on October 5, 2013 in the Ogden Museum of Southern Art’s Goldring Hall. 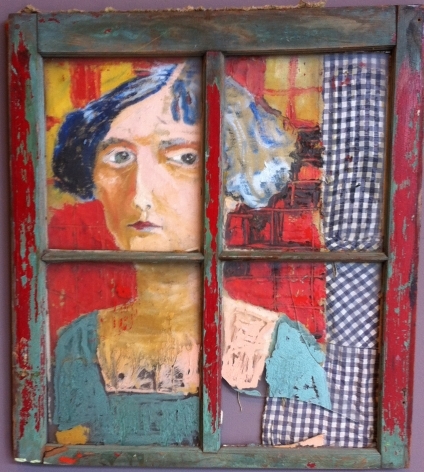 GINA PHILLIPS is a mixed media, narrative artist who grew up in Kentucky and has lived in New Orleans since 1995. 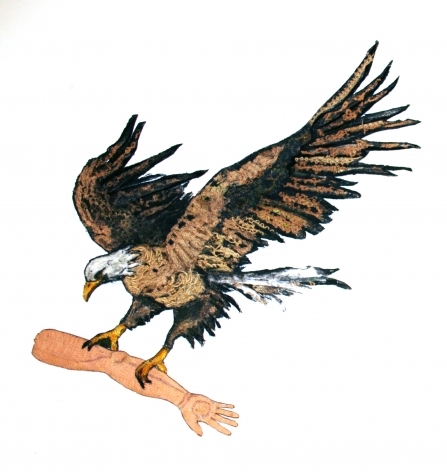 The imagery, stories and characters of both regions influence her work. 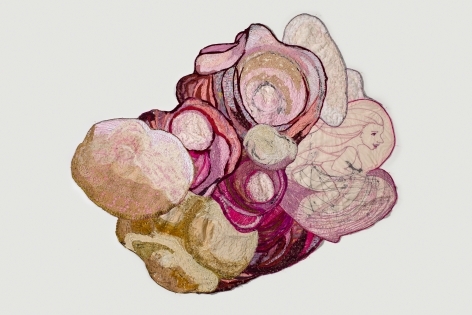 She started her career as a painter, but over the years, has increasingly incorporated fabric and thread into her work. She begins a piece with a simple under-painting in acrylic paint on canvas or muslin…then finishes the piece by appliquéing fabric and thread on top. Phillips uses a communal gathering process to source her fabrics, as neighbors, friends, family often donate to her artistic process. Her sewn work hover between two and three dimensionality and often the backs of her pieces are as interesting as the front sides. The most common narrative characteristic that runs through her work is tragicomedy. The people and/or animals that tell the story often embody a magical realism. 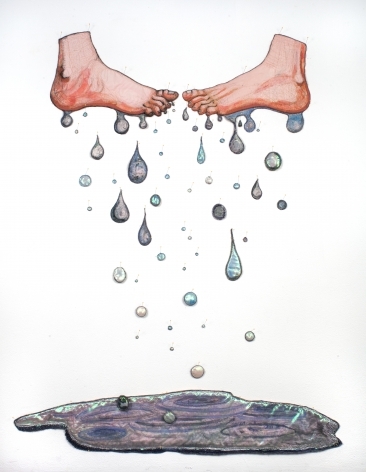 Gina Phillips has a BFA from the University of Kentucky and an MFA from Tulane University’s Newcomb College. 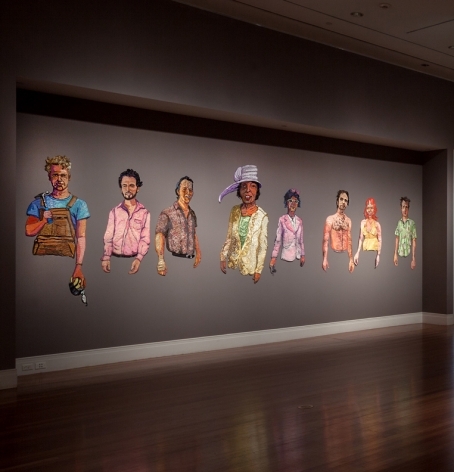 Her work has been exhibited in galleries and museums across the country including Pepperdine University, Ballroom Marfa, The Ogden Museum of Southern Art, and most recently the 21c Museum in Louisville, KY. In addition, her work has been presented at numerous art fairs including PULSE LA, PULSE Miami, Texas Contemporary and VOLTA Basel. 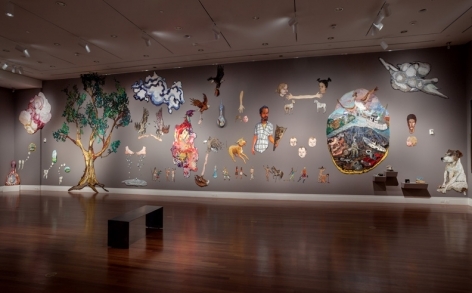 Phillips’ work has been featured in Art in America, The Times-Picayune and ARTNews, among others. 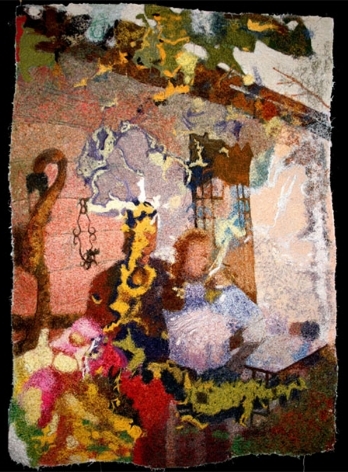 She was selected as one of twenty-seven international artists featured in the Prospect.2 Biennial of Contemporary Art curated by Dan Cameron and her collection of fabric portraits “Friends and Neighbors” was exhibited at VOLTA8 as part of Art Basel in Basel, Switzerland. 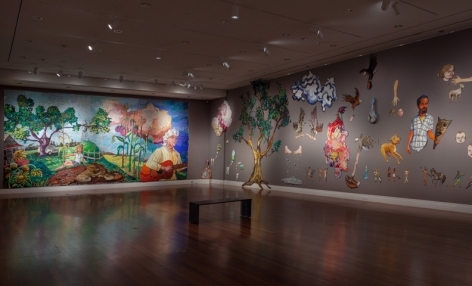 In 2014, Phillips' work was featured in a mid-career retrospective at the Ogden Museum of Southern Art entitled, “I Was Trying Hard to Think About Sweet Things.” Additionally, her work was shown in two solo exhibiitons at Jonathan Ferrara Gallery and the 21c Museum in Louisville, KY. She is scheduled for a solo exhibition at the Birmingham Museum of Art in late-2015. 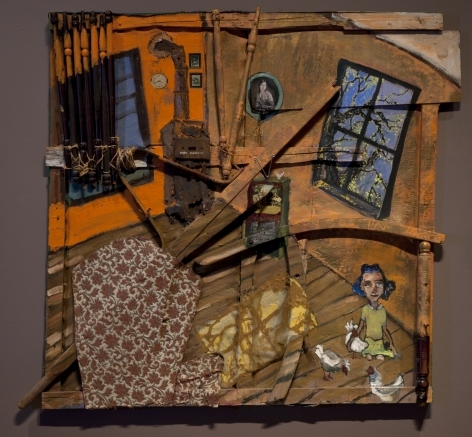 Her work is in numerous collections including University of Kentucky, Lexington; NASA; New Orleans Museum of Art; Ogden Museum of Southern Art; 21c Museum, KY; the Drake Hotel, Toronto; The Frederick R. Weisman Art Foundation; Tulane University and House of Blues (various locations across US. ); Josh Rechnitz, Thomas Coleman, Ellen and Cooper Manning, and the collection of Marilyn Oshman.